Setting your DSL Netopia Modem to Bridge Mode..
How to configure a Netopia DSL Modem to Bridged Mode. You may find that the best VoIP setup is to bridge your DSL modem and use your router or router/IAD to authenticate the PPPoE connection. This tutorial will take you through the steps to bridge your Netopia modem. The first step in configuring the Netopia DSL modem is to gain access into the modem's interface. Open a web browser and type the following URL address 192.168.1.254 and click on go. You may be prompted to place a Login Username and Password. Use admin for both username and password. You should see the following screen displayed where you will want to click on Home. Next you will want to enter Expert Mode, which you can choose from the left menu. 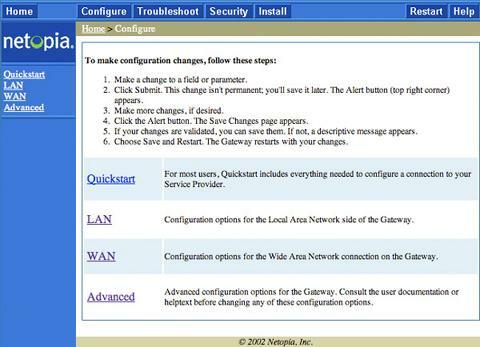 Next choose Configure from the Top Menu. Then Click on LAN. 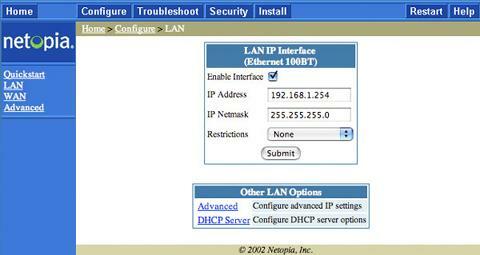 Then click on DHCP Server. In the drop down box for Sever Mode select Off and click on Submit. Bridge mode means that the device, in the case the DSL modem, will not establish the PPP link, nor will it function like a router handing out DHCP. When acting as a Bridge the device will only pass through the details to another device, like your router, which will authenticate the PPPoE connection. Essentially, it acts as a bridge between two different networks, the WAN (Internet) and the LAN (your network). The modem when in Bridge Mode will not interfere or act upon the data passing, which is an advantage in many cases with VoIP transmissions. While in Bridge Mode the device becomes "transparent" and basically accepts only one device and controls or passes all network traffic dedicated to this device.